Because we are not an auditioned choir, we accept singers at all stages of their musical development. Sometimes this can be challenging for those without any musical experience, so we encourage our choristers to help out anyone they observe to be struggling. This can mean, helping them to follow along in the music, helping with pronunciation of the song is in a different language, teaching them how to organize their music, or listening carefully to their own part! Learning from our peers is just as important as learning from our director! At the CCC we have a buddy system, where one of our younger Calgary Junior Choir members is matched with an older child in the Calgary Children’s Choir. This is a mutually beneficial relationship, where the younger chorister learns the behavior expected from our choristers, and the older child has the responsibility of modelling that behavior. We have always been impressed with how our choristers have risen to the occasion. Having an older chorister to look up to, encourages our younger singers to keep going, so one day they can be the older buddy! Part of this supportive choir community, means that there is always someone on whom you can rely. This moral support is imperative in creating kind, generous choristers, who in turn can help others who need it. This is a positive feedback loop, where we encourage our choristers to help out those around them when needed, and then if they ever need support, we can give it back to them. Understanding that support from your choir family is unconditional helps us to create a wonderful, welcoming CCC community! 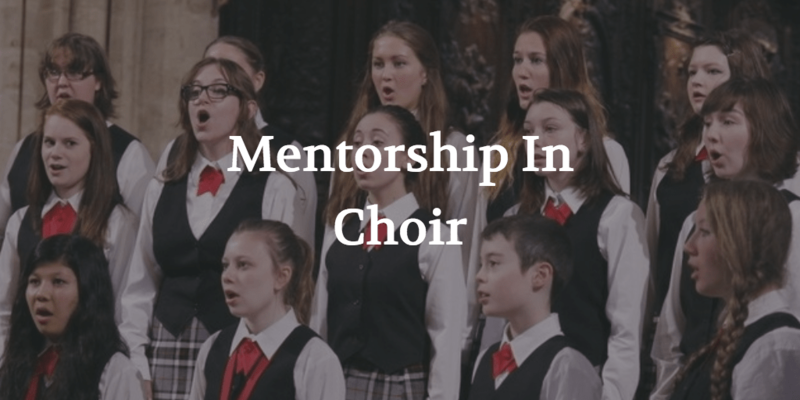 How else is mentorship in choir important? Tell us in the comments below!